I've decided to share with you some pics from several months ago when I was building my portfolio with as many shoots as possible. I worked with my friend Ashley who is also an aspiring model. She has a large eye palette so I wanted to do something bold and bright on her. The shoot was a while ago, so I'll try to remember what I used, lol. -pigments: rebel rock blue, golden lemon, true chartreuse, fuscia...ummm orange? OH WOW Ren Ren, I'm glad you found the shots and it is indeed such a HUGE difference, she looked great! She's pretty at the start but you made her into WOWWW!!! Love the make up, thanks for sharing! she looks so different and pretty! i love the colors you used on her. Aww I'm sorry for the trouble! I promise, no more changes in my URL anymore! hehe. those facecharts are awesome aren't they? shall I add you to the participants list? renren! you did great with her makeup. that last pic of her against the wall -- HOT! You did an awesome job. Love the colors you used. she looks so hot! awesome job sis! shes looking really hot, i love the last picture!!! Hello! I really like your blog and your youtube videos. I wanted to tagged you, with this "I love your blog" reward! 1. You can put this picture on your blog. 2. Put my blogs link to your blog. 3. 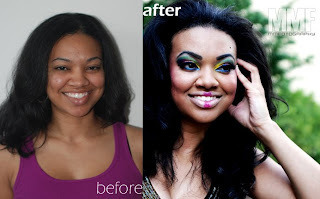 Tag 7 other bloggers and put their links to your blog and they have to tag 7 others..
she's naturally beautiful but the makeup really takes things to another level. great job.